High performance for demanding applications. Our MOVIAXIS® multi-axis servo inverter is motion control at the highest level. MOVIAXIS®: the right choice for control quality within demanding applications involving several electrical axes. Are you looking for a highly dynamic servo drive solution which meets your requirements with asynchronous or synchronous servomotors? Then take closer look at the MOVIAXIS® multi-axis servo inverters. Their versatility makes them so adaptable, from tiered motion control or simple positioning through to support of specific kinematics. MOVIAXIS® can be flexibly and individually configured for your application and in a way which allows optimal adaptation to the machine and system concepts. An axis system with MOVIAXIS® always consists of a power supply module and a variable number of axis modules. These also include optional modules such as master module, motion control or 24 V switched-mode power supply, which integrate perfectly within the servo solution both mechanically and electronically. Also available are a wide selection of communication and automation options as well as energy-efficient components such as the energy storage unit. And MOVIAXIS® of course supports all common encoder systems on the motor and track. 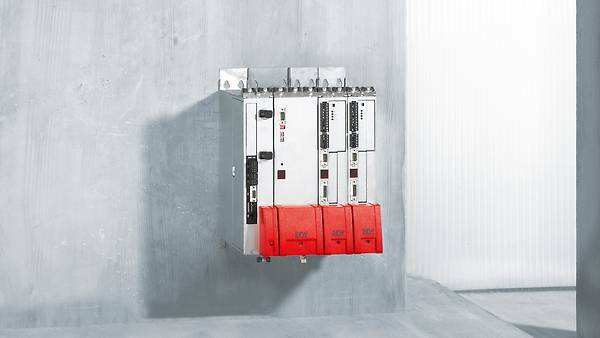 Maximum control quality in a compact design in the power range from 10 kW supply system and up to 187 kW peak power. of the axis system and less wiring work saves both installation time and space in the control cabinet. and shallow installation depth as the control technology, safety technology and energy efficiency are integrated in the compact axis system. without any expert knowledge: guided motor startup, integrated technology functions and simple connection to controllers. Braking energy is moved temporarily and utilized during the next acceleration process. can be implemented with external retrofitable UCS safety modules with encoder interfaces specifically tailored to MOVIAXIS®. safeyDRIVE is our contribution to your plant and machine safety. In addition to functionally safe drive technology, we are offering various safety services. safetyDRIVE not only helps you to prevent accidents, but also reduces costs in safety zones and increases productivity. There is huge energy potential in applications with lowering and braking movements of the load cycle.